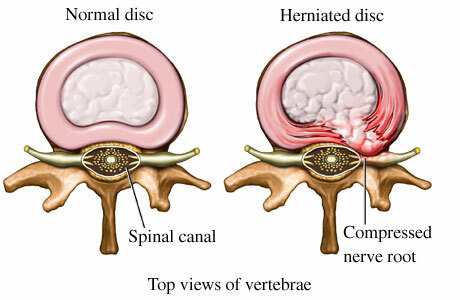 A slipped disc (also known as herniated, ruptured, or prolapsed disc) results when the shock-absorbing pads or intervertebral discs filling the spaces between the bones of the spine, split or rupture. The discs contain a jelly-like substance that seeps out into the surrounding tissue, causing pressure and pain to the spinal cord or spinal nerves in the area of rupture. Slipped discs most frequently occur in the lower back although any disc of the spine is vulnerable to rupture. The spine is made up of bones known as vertebrae, separated by fibrocartilaginous intervertebral discs. There is only slight movement between any two successive vertebrae, but there is considerable movement throughout the spinal column as a whole. The intervertebral discs are composed of a thick ring of fibrous cartilage, known as the annulus fibrosis which surrounds a jelly-like material known as the nucleus pulposus, and provide flexibility, cushioning, and protection to the spine. The spinal canal runs through the center of the vertebrae and discs and contains the spinal cord running from the brain stem to the first or second lumbar vertebrae. Improper weight lifting technique. Excessive strain. Forceful trauma to the vertebral disc. Pain in the back or neck. Numbness, tingling, or pain in the buttocks, back, legs, or feet. Difficulty controlling bowel or bladder. Slipped or herniated discs require medical attention and evaluation. Symptoms of slipped disc may indicate other underlying ailments including fracture, tumours, infection or nerve damage, with serious – in certain cases, life-threatening – implications. Bed rest and limited activity for several days is usually indicated, though normal, non-athletic daily activity should be resumed soon thereafter, to prevent atrophy and restore mobility in the spine. Physical therapy may be combined with massage and gradually increasing exercise of the back, after the pain has subsided. Strengthening and flexibility exercises, proper warm-up, avoidance of excessive or sudden weight lifting and attention to good sports technique may help avoid the injury. 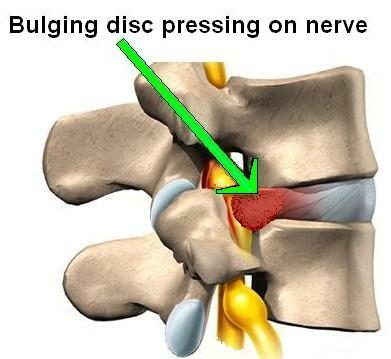 Most disc injuries are resolved without surgery, given proper recovery time. Though full restoration of strength and mobility may generally be expected, discs are vulnerable to re-injury, particularly for weigh lifters and athletes placing significant demands on the back muscles, tendons, and ligaments and on the spine itself. Call (+65) 6471 2674 (24 Hour) to fix an appointment to see our doctor regarding slipped disc today.